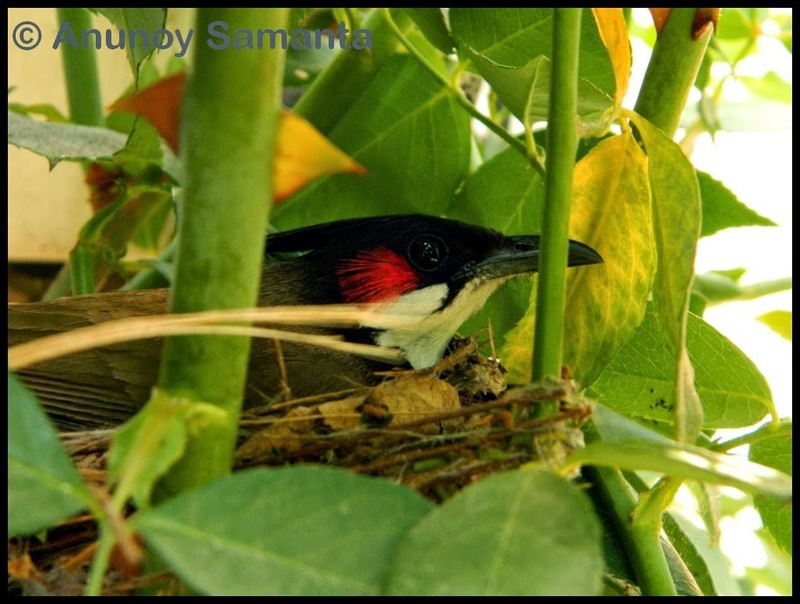 The lady Bulbul had engineered a tough nest inside the rose shrub! 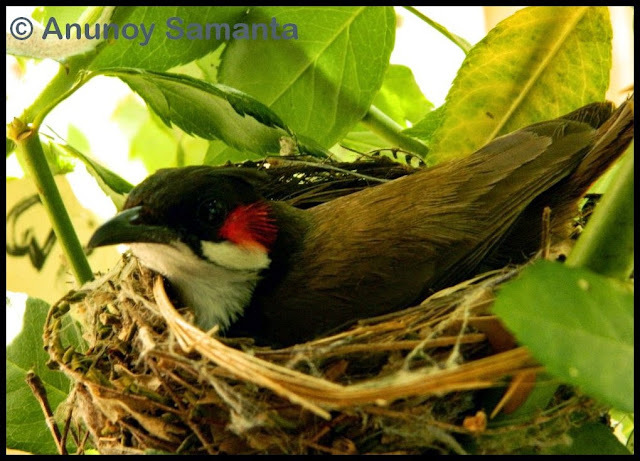 Bulbuls usually make such soup bowl shaped nests on bushes, thatched walls and small trees. Doesn’t her eye portray the great expectation of an expecting mother? In the beginning it seemed my photographic enthusiasm may scare away the hatching Bulbul but soon I discovered her fearless disposition as she hardly care my careful yet close efforts with the lens. The eerie scientific name- Pycnonotus jocosus hardly does justice to red-whiskered Bulbul’s pristine innocence. Don’t you feel the same when you look onto her eyes? Get out of the hangover from her beautiful eyes and note the unique beaded pattern around the margin of her eyes. 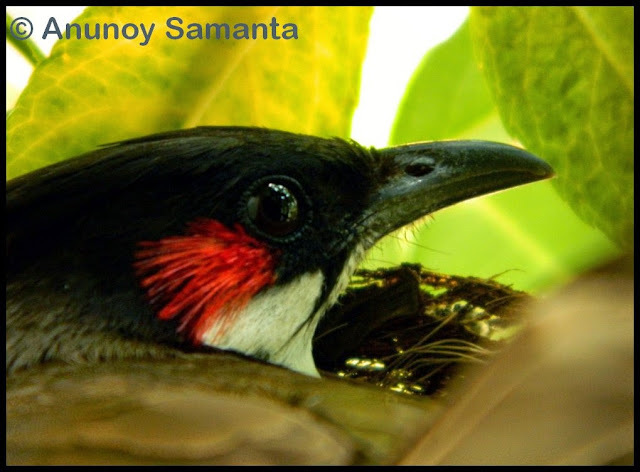 Whenever I was away the lady Bulbul was opening her beaks and closing them at my sight. It was quite hot then, so, I assumed it heat regulatory mechanism. Please correct me with proper facts if you’re a zoologist or a bird enthusiast. Note her fine whiskers! 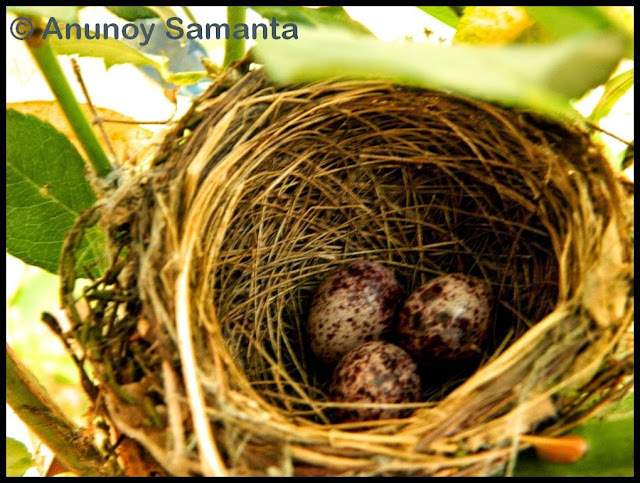 Once when the mother Bulbul took a flight I grabbed the platinum opportunity to peep how her eggs looked like. The clutch contained three eggs, all pale mauve ground colored with dotty pigmentations turning blotches towards their broad ends. I found Bulbul eggs very interesting. On a closer look no more details could be elicited as the optical stabilization failed to give me a clear shot of those Bulbul eggs on zooming farther. My bad luck! Eggs usually take 12 days to hatch and it was my 4th or 5th day. The lady Bulbul was back and gave me a nasty stare as if she smelled my previous actions. I tried to give her a pacifying smile and explain that everything was all right but see seemed unimpressed! Well this was my last shot of this Bulbul family. Something worse followed in my life and I couldn’t welcome those three Bulbul kids. 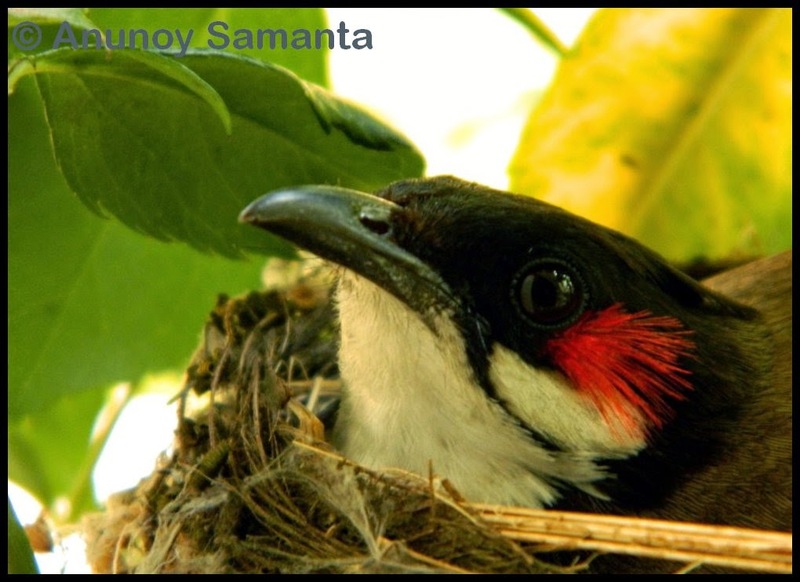 Well, you might have expected the photographs of newborn Bulbuls too just like I expected to capture them. 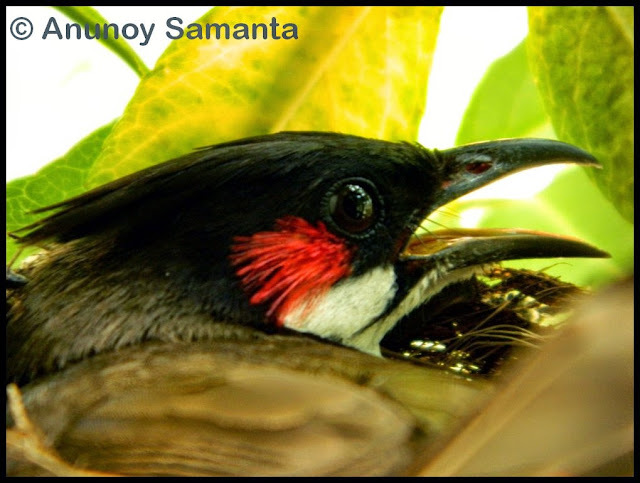 But after following the watchful mother Bulbul for 3-4 days something unexpected and really very unpleasant incident happened in my family that completely blew me off. 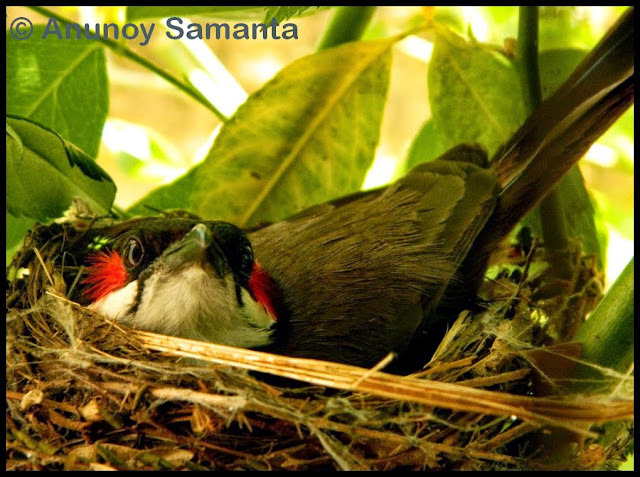 After a couple of weeks when I could remember of red-whiskered Bulbul family, I ran to their old location only to find an abandoned nest over the shrub with no sign of any bird, not even a feather! A postmortem of the left over Bulbul nest revealed that it was woven with twigs, roots, grasses, leaves and even bits of papers as well as plastics! It’s all right... everything happens for a good reason... the fault lies in us that we fail to see those reasons. Na, I’m not involving any sarcasm here... I’m simply hopeful of finding some other breeding bird to photograph in my garden very soon and I swear not to be selfish to keep them hidden in my portable storage. 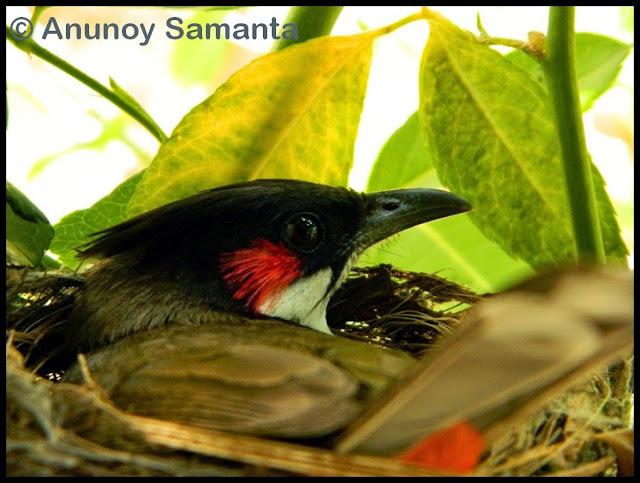 I have heard that Bulbuls may breed twice a year. Who knows my lens may catch up with the same lady when she hatches again! Meanwhile you might be interested in checking out the 2015's Photo Series of Birth of two Bulbuls in my Washroom.